Curried dishes run the gamut from sweet to hot with sweet-hot somewhere on the continuum. Curry powders vary greatly as well. Find one you like and stick with it. Nothing is more disappointing than picking up a container from the grocery store shelf only to find it greatly lacking in flavor when you apply it to dinner. Heat the oil in a heavy soup pan, medium-low heat. Add the curry, ginger, cumin and red pepper flakes. Stir for a couple of minutes while the seasonings roast and become fragrant. Do not walk away! They can burn in a flash and you will have to start over. Add the garlic and stir for a moment. Do not let the garlic brown. The flavor will overpower this delicate soup if you do. Pour the broth into the spice mixture and stir well. Loosen anything that may be sticking to the bottom of the pot. Put the pumpkin puree in the blender and add the soup stock. It should just fit. Blend well. Warm the coconut milk in the soup pan and then add the blended pumpkin and soup stock. Salt with fish sauce or sea salt according to your own taste. Serve with a sprinkling of finely minces cilantro on the top. The green of the cilantro sparkles against the orange hue of the soup. It also adds a subtle earthy quality. Make a meal of this soup with a crispy green salad tossed with a vinaigrette and hot from the oven sourdough bread. Can you turn your jack-o-lantern into a pumpkin pie? 16 Comments on "This soup is so pumpkin-y and coconut-y that it’s almost sweet…"
This looks awesome! I will have to try it, I always have pumpkins through the winter. Coconut milk always adds such a lovely dimension. Beautiful soup. This sounds great. I make a butternut squash soup with coconut milk, but I’ve never tried a curried version. Thanks so much for sharing this recipe with Sunday Night Soup Night. I’ll be hosting weekly through fall and winter, so I’d love to see you again with your next soup/stock/chowder recipe! This looks sooo yummy! 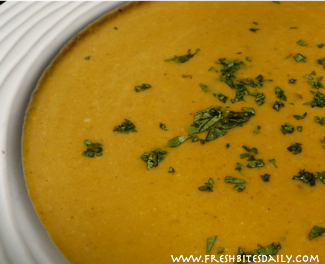 I absolutely love pumpkin soup and will have to give this version a try. Thanks! 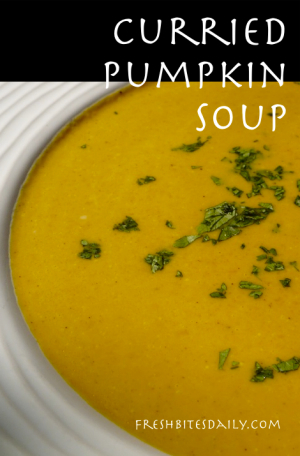 I would love for you to link this soup recipe up to a “PUMPKIN” link up that we are hosting today! It fits in perfectly! I love Pumpkin Soup and would just love your Curried Pumpkin Soup. It has a wonderful blend of spice that would just be delicious! Thank you so much for sharing with Full Plate Thursday. Hope you have a great week end and come back soon! this looks amazing for fall! Thanks so much for linking up!!! This dish is no match for those steak. Healthy and nutritious. I’ve tried pumpkin with various ingredients but not with coconut oil or coconut milk. This curried pumpkin looks and sounds very tasty. I’m imagining how it’d taste if some deep fried or roasted chicken pieces are added to this tempting curry.